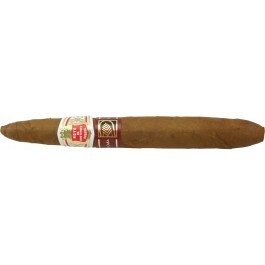 The Hoyo de Monterrey Elegantes, only sold at La Casa Del Habanos shops, is a unique taco, 47 ring gauge, 6.25" (158 mm) long and comes in a box 10 cigars. Hoyo de Monterrey Elegantes is a refined Habanos for an hour and a half of enjoyment. It is only available in La Casa Del Habano stores. • Despite its young age, it shows a nice complexity of aromas that should only get better as it ages. Tapered at both ends, the Hoyo de Monterrey is a beautiful sight to behold; the wrapper has a nice reddish brown tone, a colorado, and it has a nice sheen of oil and a little bit of tooth on its surface. It is rather veiny but somewhat soft when squeezed. At the foot, the cigar lets out generous aromas of barnyard, nuts, wood and grass. Once cut, the cold draw is on the tight side, but gives ample woodsy and leathery flavors, along with some nuts, spices and a bit of citrus. The draw is rather difficult at the beginning, but soon starts to open up after the first couple of puffs. It then becomes almost perfect until the nub, while the burn is also flawless from the first light up on and doesn’t require any attention. The Hoyo de Monterrey Elegantes starts off gently with some flavors of leather and barnyard mostly. It is very creamy and light overall, as sweet notes are also present, such as caramel, cinnamon, but also some deeper flavors such as cedar and coffee. Some punchy pepper notes are slowly creeping up, especially in the retrohale. The cigar is a solid light to medium until the end of the first third. In the middle part of the Hoyo de Monterrey Elegantes, the flavor profile is now definitely edging on the mineral side, with more leather and bitterness. The creamy cedar receded to the background, but the creaminess remains. A nice complexity of aromas is developing, deep flavors of black coffee, bitter cocoa, nuts and grass. The spicy aspect is also more noticeable, with some white pepper and cloves. The overall strength of the cigar increased steadily along this middle third, and the Elegantes is close to a medium bodied cigar right now. The last section of the cigar is again showing an evolving character, the leather remains in the foreground but a mellow grassy flavor is now the main flavor. The complexity of flavors remain present in the background, with still some caramel sweetness, spices, cedar, black coffee and dark chocolate. The strength hasn’t evolve since the middle mark of the cigar, and is just shy of a medium.